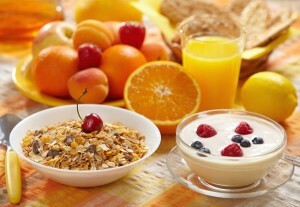 Most supermarket bought muesli cereals are high in sugar and contain processed carbohydrates. Toasted muesli also contains damaging vegetable oils. Make your own homemade muesli. You can use olive and coconut oil to toast your own muesli. You can avoid using sugar or use sugar-free alternatives and can make it grain-free by using quinoa flakes or other grain-free alternatives. Fruit juice is just straight up sugar and, in my opinion, as bad as a fizzy drink. In fact, fruit juice can contain more sugar than a can of Coca Cola — up to 12 teaspoons per glass. You are better off eating a whole piece of fruit so that you consume the fiber along with the antioxidants, vitamins and minerals and feel full after one or two pieces. Make your own juice with 80% vegetables and 20% fruit. Or have a green smoothie instead. I love smoothies you can include the fiber with nothing wasted. I always include protein, vegetables, good fats and low fructose fruits like berries. Don’t have gluten-free toast and think you are doing yourself a favor. Most contain sugar, thickeners, stabilizers and emulsifiers to give them the same texture as the gluten based breads. Also many gluten-free products are made from corn, potato, tapioca and maize starch, which send your blood sugars sky-high. Try instead spelt sourdough or paleo-style bread which is gluten-free, high in protein and nutrient dense. Sourdough is made with a fermented dough that makes the bread easier to digest and doesn’t cause undesirable spikes in blood sugar levels. The gluten in sourdough is rendered and is less likely to cause food intolerances. Spelt is an ancient grain which has lower levels of gluten that people find easier to digest. Have you seen those fruit salads that are piled high with fruit the size of a truck? I suggest having no more than three pieces of fruit in a whole day. If you are going to eat a mountain of fruit which contains sugar you are going to have spikes in your blood sugar levels and leave you hungry for more. Add protein like greek yogurt and chia seeds to low fructose fruits like berries. Avoid hash browns fried in vegetable oil and for that matter everything fried in vegetable oil. Eggs are great, but for kids, we usually serve them with tomato or BBQ sauce’s, which tend to be laden with sugar. Your average BBQ sauce has 2 teaspoons of sugar per tablespoon of sauce. You also might want to re-think the side of white bread containing gluten and no fiber. Cook with coconut and olive oil. Include veggies like tomatoes, mushrooms, asparagus and avocado. Have paleo-based breads. Include healthy proteins like turkey sausage or bacon, smoked salmon and eggs. Don’t be scared to think outside the box. Breakfast can be the same as lunch and dinner. It’s OK to have leftovers. Make sure you include real food, good fats, vegetables and protein.